Oh my goodness! That looks fabulous! I’m such a fan of that rich deep red and it looks great with all of your accessories…And I can’t believe you got that cupboard for $2 – what a find! I can’t believe you bought a cupboard like that for $2.00 – what a find. Your hubby did a great job in painting it red – it makes me smile. WOW! What a find, I’m jealous 😛 I love the red, it looks beautiful. What a wonderful find…the new color of your cupboard is just beautiful! What brand/color paint did your husband use? I have a solid (though not pine) dining cupboard I could paint. I love the red. Years ago my husband found an old chest of drawers. Knowing I had dreamed of owning a red cottage-style cupboard for years, he decided to turn his new find into a surprise. 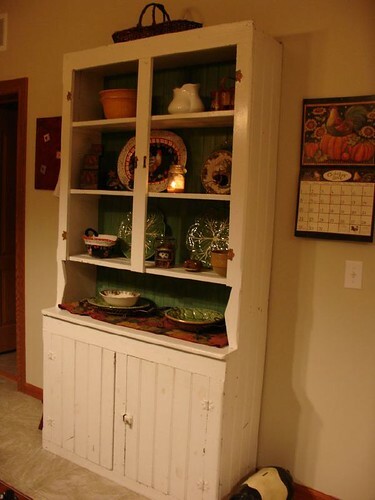 He simply built a hutch back, shelves, and sides onto the existing old chest of drawers, painted it barn red, and added simple wooden hardware. It has been the highlight of my living room for years and looks very similar to Pearl’s beautiful cupboard. 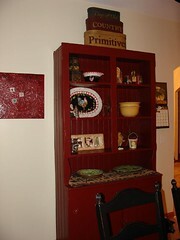 The red paint tied the cupboard and my husband’s creativity together, making it look like one solid piece. When I filled it with old books and china, it looked like an antique store find! By the way, he found another larger, longer chest of drawers shortly after and recreated the same type of cupboard… but this time, he made the shelves reach almost to the ceiling…It became my treasured dining room china cabinet which houses my English china collection. Ladies, put your husbands to work looking for roadside treasures! Hello, I just signed up..
I’m so glad to have found this site! It is good to hear from like-minded people for a change. me too Mary! I think it is going to be fun! I too got a great deal on a huge cabinet. It is very old, not sure how old but when our Amish friends were moving they were going to burn it. They had used it for tools in their woodshop.He said if you can get your husband to move it it is yours! I gave them a ride to the grocery store and he said the cabinet is paid for now. I store my craft books in it and use it for displays in my craft shop and whenever I am changing things around in it I fondly think of my kind friend Noah! Thanks for sharing your stories and photos, so inspiring! PS He also gave me a bunch of old doors and window frames. My husband just laughed and said do not ever say anything to me about bringing home junk. I have used the doors as displays at several photo shows now and everyone loves the unique look!